Reading... The book Brooklyn. I have had it for several months now and am slowly getting into it. Playing... Sudoku on my phone. I had never played before, but while I was in Chicago I gave it a shot and now I'm addicted. Trying... To make plans for our anniversary getaway and for a trip I may be taking with some friends. So many details to work out! Cooking... Everything on the grill! I grilled tri-tip and veggies by myself for the first time the other day and now I want to grill allllll the things. So yummy! Eating... Yummy catered breakfast and lunch at my internship everyday. Yes, we are very spoiled. Drinking... Vanilla coffee. We have awesome coffee machines at work and I am trying to not get hooked on caffeine! Texting... My sister because she is awesome and I miss her. Pinning... Branding inspiration for a bakery I am designing things for! Going... To bed early these days because I have been so tired from working so much! Loving... Swimming pretty much every afternoon at my nanny job! Makes those 10 hour work days a lot better! Hating... The fact that I have to get some stuff done to my car this week which just means $$$. Discovering... What I am really interested in for a career and also what I do not want. Thinking... Of all the things I would like to accomplish this summer and that I should probably write them down so I can start working on them! Feeling... Generally happy about life right now! Good things are going on. Hoping (for)... A miracle to happen and I find a place to move to soon! Listening (to)... The Gilmore Guys podcast. I still have not caught up to the present day episodes, but I have been loving listening to them while I drive everyday! Plus, with the GG revival coming, it's been extra nice getting ready for that! 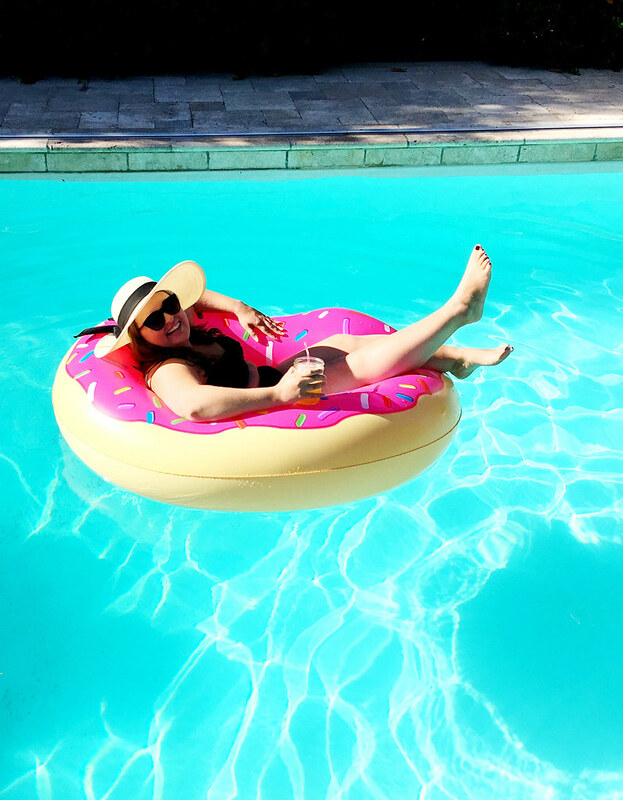 Ordering... That pink donut pool float and other things from Amazon because Amazon is king. Gotta love that Prime shipping! My sister also introduced me to Jane.com and that site is dangerous too! Considering... Taking off on an adventure this weekend! It is a holiday weekend after all, so why not? Starting... To blog more often! I have really missed blogging consistently and would like to get back into it! How was your June? Did you do anything special? How is summer treating you so far?